A lifelong but sometimes tenuous involvement with railways includes curiosity about those abandoned and fading back into the earth. The ‘Westward' photographs of Mark Ruwudel, the ‘Machine in the Garden' images by Jeff Brouws, and others, have been of particular interest. Here, agriculture has reclaimed a cutting at the northern end of the Hexham & Allendale Railway, opened in1848 and closed in 1950. Some twelve miles in length the railway served the mining, quarrying and agricultural communities in Allendale. Finance was tight and the line never got beyond a temporary terminus at Catton about a mile short of Allendale town; it was renamed as Allendale in 1898 and remained the end of the line. In 1876 the Company was absorbed by the North Eastern Railway. The seven mile climb to Langley reached 1:50 at one point. Here, what may have been a platelayers' cabin stands by the track bed. A large lead smelting works at Langley processed ore from the surrounding area. 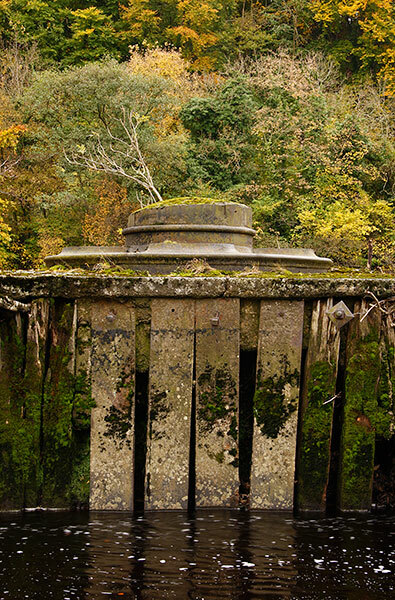 The poisonous fumes the smelt mill generated were drawn through a horizontal stone flue that crossed over the tracks by the foreground bridge. It continued upwards to reach the tall chimney still set high on the moor to the south of the railway. The smelter was downhill to the right. The bridges and Langley station are beautifully preserved in a linear garden setting open to the public as Langley Garden Station. 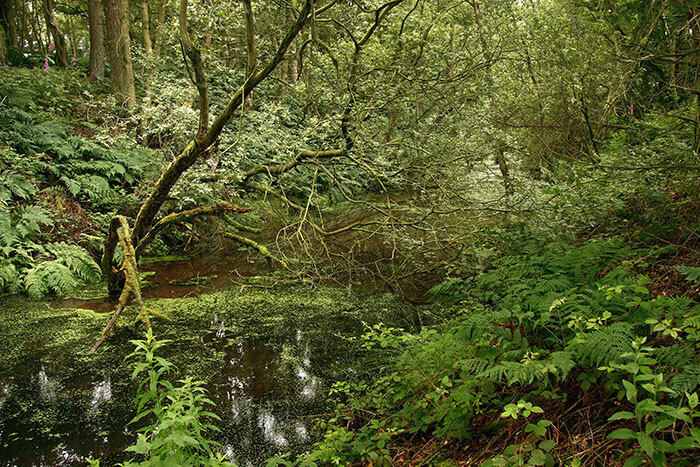 Beyond Langley, the track passed extensive brickworks into a cutting now flooded and quite tropical with rich vegetation and a long linear pool. It's difficult to visualise the last 3.37pm passenger train from Langley station steaming through here as it headed for Allendale in 1930 when the timetable was withdrawn. Freight services continued until full closure in1950. 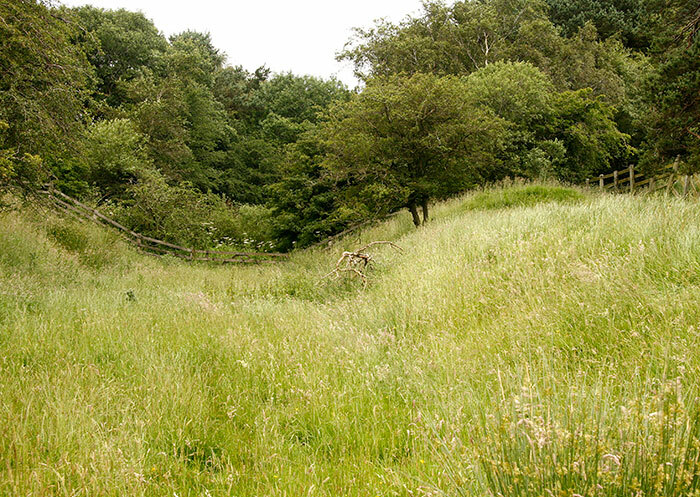 This is the other end of the cutting in the previous image as its now gently rounded slopes merge into farmland. The next station at Staward is the last before Catton. 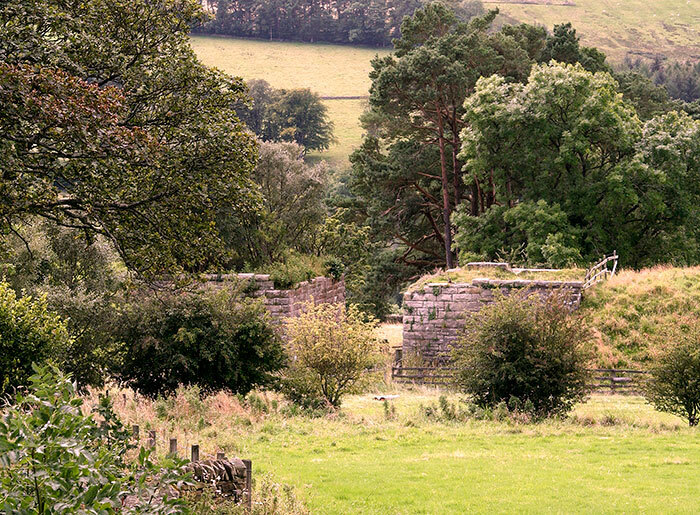 In the nineteenth century, mining and related activities were an important part of the North Pennines economy until their decline into the following century. Allendale, Allenheads, Nenthead and Alston retain a strong sense of that time. Some industrial buildings have been preserved or found new uses, some are ruinous but many have gone. The railway traverses picturesque landscapes with wide and varied views of distant hills, deep valleys, woods and fields. 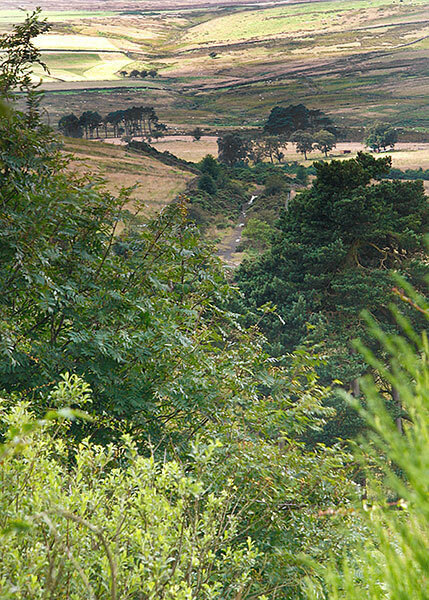 The sinuous track alignment follows hillside contours high above the Rivers Tyne and Allen. These bridge abutments carried the rails on simple beams across Colliery Lane: there is no trace of the colliery to which it presumably led. 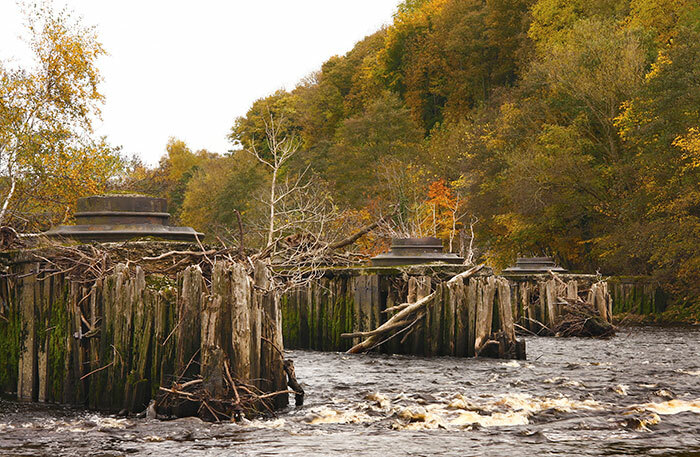 The Hexham & Allendale Railway left the Newcastle & Carlisle Railway (1830s) at the same point as the Border Counties Railway crossed a once substantial six-span cast and wrought iron bridge built above these now decaying piers. Flood damage ended passenger services in 1956 and freight in 1958 although a freight link to Bellingham lasted until 1963 along the Wansbeck Valley Railway from Morpeth. 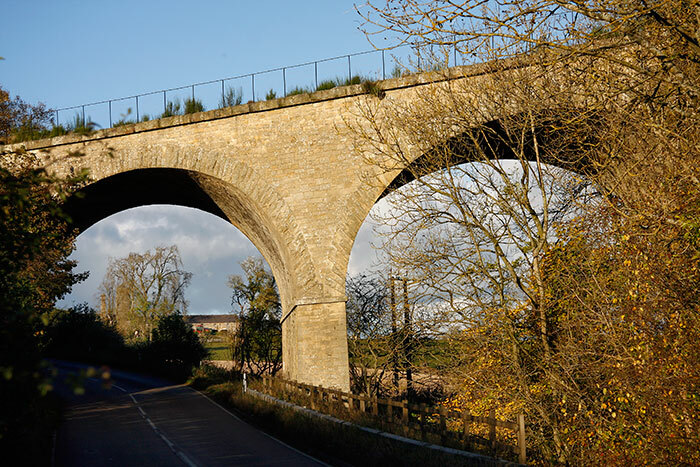 Routed through the North Tyne Valley the railway joined the Border Union Railway at Riccarton Junction across the border with Scotland. Construction began in 1855 and the line opened in stages until completion in 1862. Finance was difficult and the project was taken over by the North British Railway who also acquired the Border Union Railway between Edinburgh and Carlisle. The forty-two route miles had sixteen intermediate stations but only those at Wark and Bellingham served settlements of any size. Quarries, timber, agriculture and the coal mines at Plashetts to the north provided revenue but overall the rail company income was small. 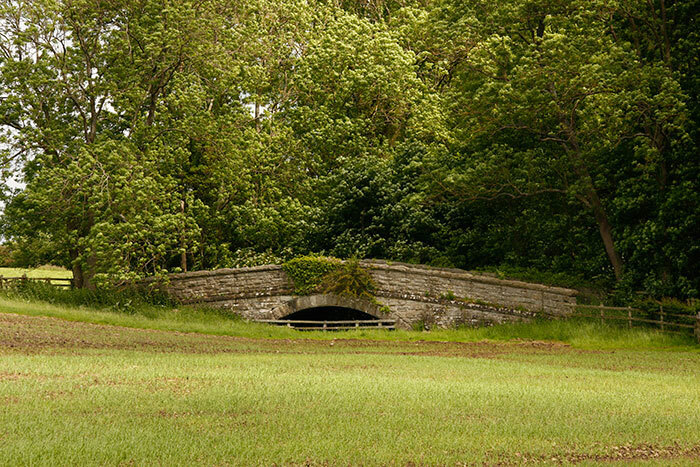 This skew arched bridge over a minor road is overgrown but still in good repair. A little further on a high and curving embankment carried the tracks to a more substantial skew arch bridge close to Chollerton Station. This is a small hamlet with a fine c11th Century church, a small number of houses and a large farm. 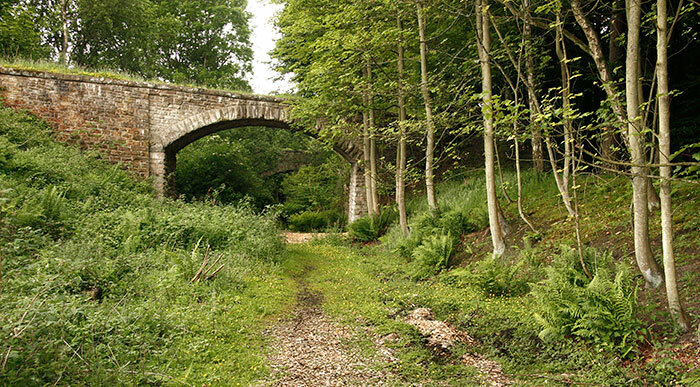 Although laid with a single track the under and over bridges were built to take two excepting the iron bridge at the junction with the Carlisle line. 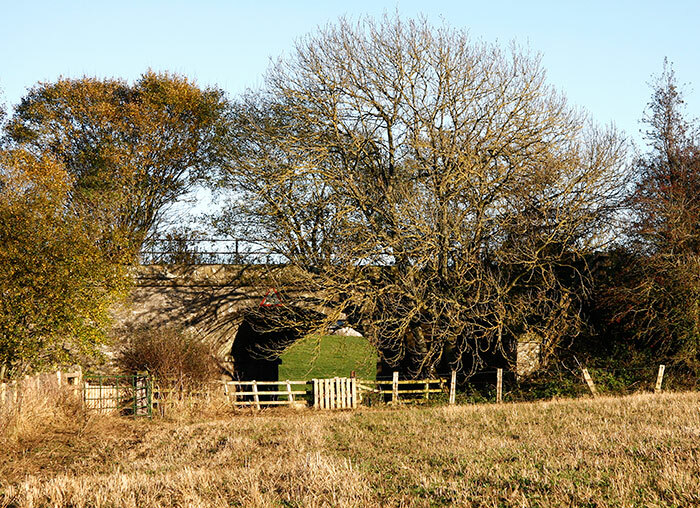 Beyond Chollerton and some fourteen miles from the Border Counties Junction this over bridge is typical of the many built to carry farm vehicles or narrow public roads. Some footpaths follow the rail line and others cut across on the level. 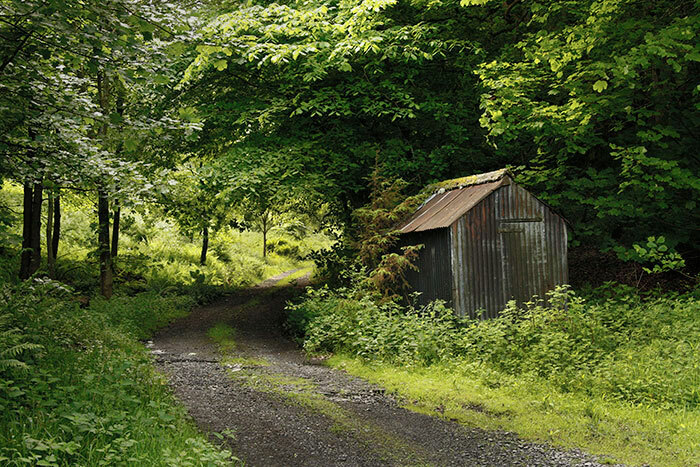 Narrow country roads enable further access. During a very wet 2012, walking was sometimes both difficult and tiring. At Wark a narrow gated road to Redesmouth village (Reedsmouth Station) strikes out across the fells and intersects the line at a few points. Looking over one side of this bridge the water-filled tractor ruts glisten through branches to echo the rails that once lay there. Over the other parapet the wheel trails are more slender as they cut through the trim grass covering. Travelling to Riccarton must have been a great visual pleasure through such a varied landscape: twenty seven miles remain for exploration. Robert Stephenson was consultant engineer to the 1834 Stanhope & Tyne Railway linking Stanhope in Weardale with South Shields at the mouth of the River Tyne. Limestone, ironstone and coal were plentiful in the north-east and the Stanhope & Tyne was one of many lines aiding their extraction. This over bridge is on the four-mile locomotive operated alignment of 1859 built between Rowley and Waskerley to replace the original rope hauled incline of 1834. A fragment of that earlier route can be seen in this view from the later track. Further ahead and out of the image to the left is the Nanny Mayor's Incline leading up to Waskerely Station. Gravity operated, the loaded wagons descending pulled their cable-linked empty counterparts to the top. The name derives from Ann Mayer, a local woman who ran an alehouse at its foot for the benefit of incline workers and train crews. A few barely discernible blocks in the track centre might once have carried the winding cable pulleys. 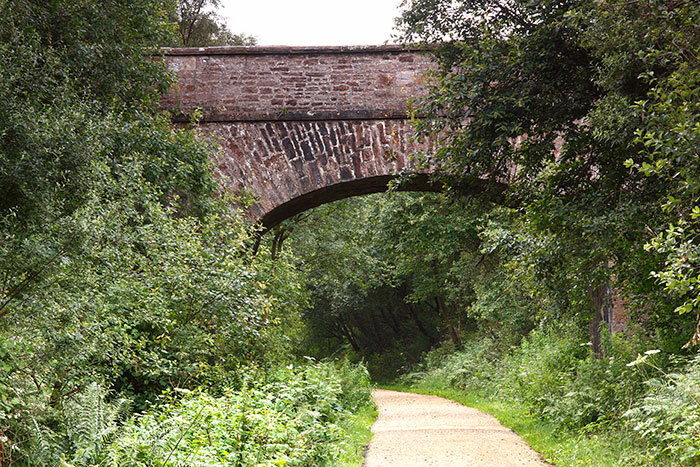 The 1859 alignment and the line westwards to Parkhead are now part of the Waskerley Way that's linked to a greater network of footpaths and cycle ways. 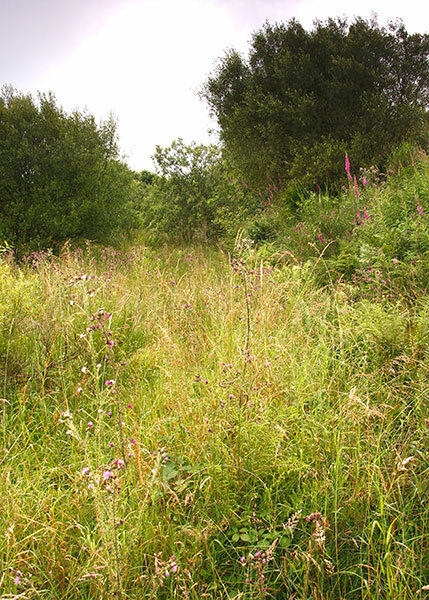 Short stretches like this survive untouched as sheltered wildlife havens. The Stanhope & Tyne Railway had financial problems and was sold in 1839, ultimately to be acquired by the Stockton & Darlington Railway in 1845. The lines in this area were closed by British Railways in 1965. The foreground track slopes gently towards the much sharper gradient on the incline. A goods shed survives at its Waskerley summit but little else railway related has survived. The prominent building to the left of the line is a former church. When the railway first opened the wagons were moved by gravity or steam powered inclines, horses and steam locomotives. The towering engine from the Weatherhill Incline above Stanhope now operates electrically every day in the National Railway Museum in York. 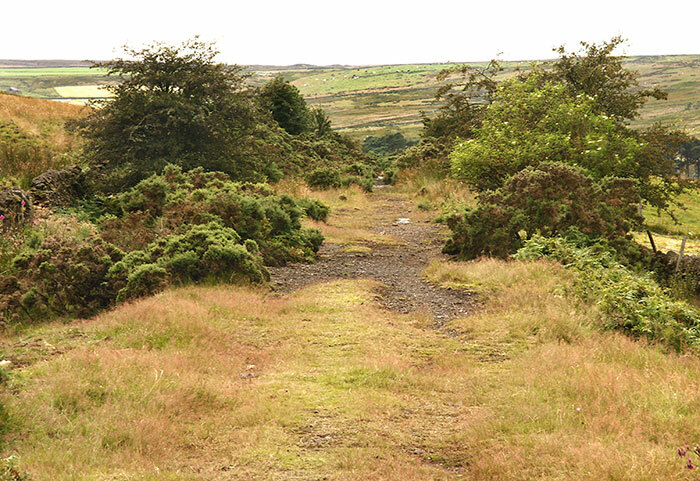 This stretch of the original track bed is close to that visible in Image 14. Behind me the footpath was blocked by a recently dumped mound of building rubble. Climbing around that, the path led to a long and waterlogged cutting so churned by cattle as to become impassable; the climb out was difficult. 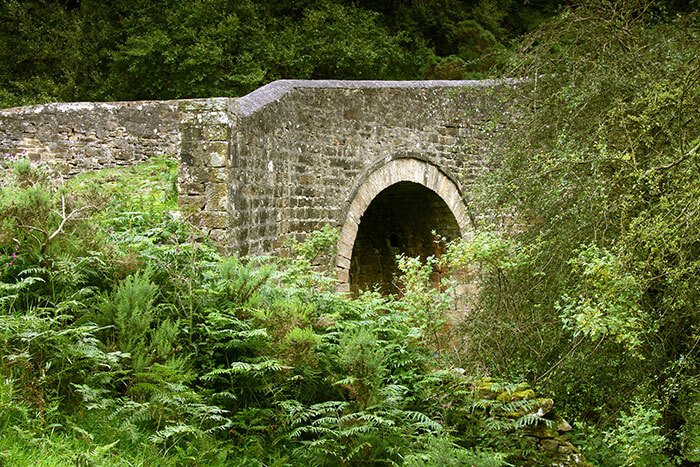 The 1834 Healeyfield Bridge is out of sight of the Waskerley Way on the hillside above. 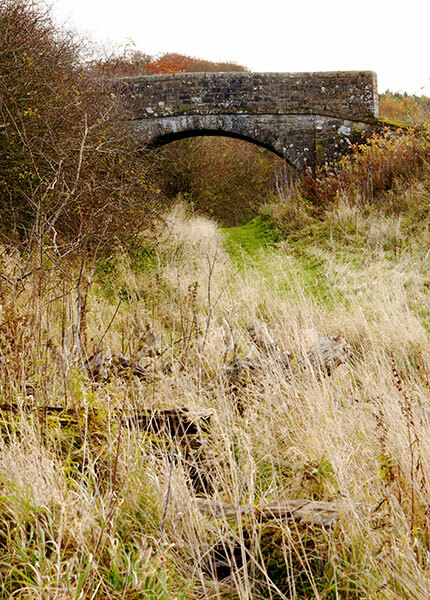 Its elegant horseshoe arch was built to a tight single track loading gauge and is in remarkably good condition. 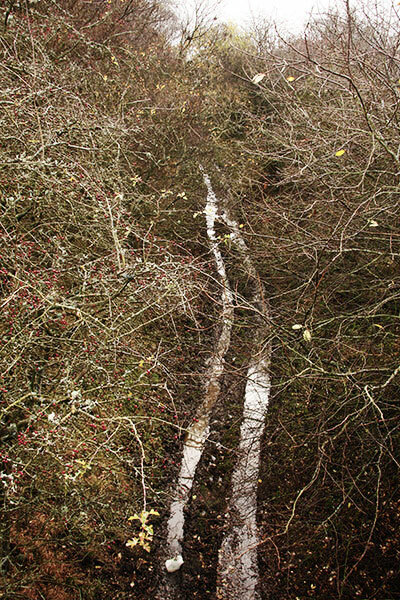 The lightly used farm track keeps access open. The station buildings from Rowley now form part of the railway system at the Beamish Open Air Museum.